In the last year alone, from July 2017 to June 2018, there have been 223 burglaries in Stratford; this figure does not look to be falling. Moreover, there have been 324 vehicle crimes in the past year; the number of vehicle crimes has been continuing at a high level and thus it is important for you to keep your home and your car safe by seeing your locksmith in Stratford; R&M Locksmith. As a locksmith in Stratford, our services include auto locksmith, commercial locksmith anddouble-glazing repairs. At R&M Locksmith we are proud to offer our customers an honest, reliable and value for money service. We are a skilled locksmith company who have years of experience and are able to resolve your current situation whether that is ‘I’m locked out of my house’ or ‘I left the car keys in my boot’. We also specialise in double glazing repairs, if it is a window handle or lock that doesn’t work or a cracked glass panel, rest assured we can restore these in no time. If you find yourself in need of a locksmith in E3, E15 and E20 you can count on us to help at any hour of the day. Stratford was refurbished in 2012 for the Olympic Games; it is now home to Westfield shopping centre and East Village. It also has a plethora of fantastic sports venues including the London Aquatics Centre, the Velodrome, the Queen Elizabeth Olympics Park and the London Stadium. Stratford is the social and leisure hub of East London. As there is such a large volume of the public that visits Stratford daily, R&M Locksmith has observed that there is a high crime rate which means necessary safety precautions to be taken and so we have a locksmith in Stratford to help you when you need us. 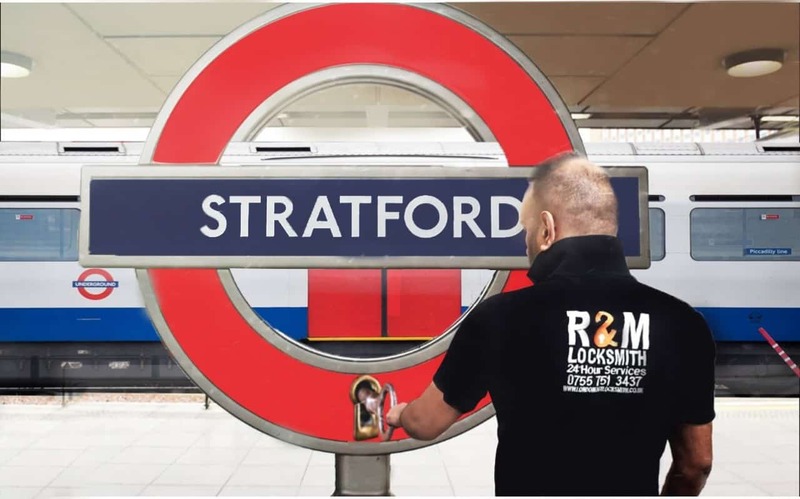 R&M Locksmith provides a locksmith in Stratford and to neighboring areas such as Bromley-by-Bow, Hackney, Homerton and Leyton. The locksmith in E3, E15 and E20 would see to your needs promptly and fit the locks you need for your security and safety immediately. We want our customers to feel safe and reassured hence why we provide you with our top locks with lasting durability. We aim to be with you in less than 30 minutes to deliver you fast and instant help. Give us a call on (+44) 7557513437 for a free advice and a quote from one of our locksmiths!